How do you carry on business as usual while your physical environment is completely restructured around you? That’s what will happen at Anderson School of Management next January. Students and faculty both will see and feel the change when they are moved out of the school’s west building, which will be demolished to make room for the new McKinnon Center for Management building while classes continue on a regular schedule. A portion of Anderson classes will be moved to different locations on campus, online or as webcasts. Steve Yourstone’s Management 300 class is an example. This spring he taught about 60 students in a classroom, while another 20 joined the course on their laptops from anywhere they have an internet connection. Next spring he will teach from his office and everyone will join via laptop since fewer classrooms will be available during the demolition and subsequent reconstruction. Drawing of McKinnon Building as seen from the south. “We’ve had to become creative about how we interact with students,” he said. Students can see him and ask questions, and he can all on students he sees in his computer monitor. Several more courses will be taught through the web conference center he uses and others will shift online. Faculty members are already in change mode. Seven faculty members have volunteered to share the offices in the east Anderson School building. Six faculty members will move out completely and use a ‘hotel suite’ office to schedule office hours or consultations. Other faculty members will shift to temporary space in nearby buildings in Hokona Hall or in the University Advisement and Enrichment Center. Planners say all faculty in Anderson West should have their offices boxed up and ready to move by the end of December. In January, the UNM Office of Academic Affairs will take all desks, bookcases, office chairs and other equipment left behind and repurpose it. The Physical Plant Department will disassemble any reusable equipment in the building and move it out, then a crew will take over the building to remove asbestos. In early spring, the building itself will be leveled, and new construction will begin immediately after that. By fall 2018, students and faculty will make themselves at home in a completely new building. In the old building classrooms opened directly to the outdoors. Students leaving class in bad weather had no incentive to hang around, and limited places to go at Anderson even if they wanted to. In the new building there will be a large open space on the first floor furnished with tables and chairs to encourage group work on projects and to give students more incentive to mix and talk with other students and faculty. Each of the four floors will have student gathering spaces and several group study rooms in the new building, which will make it more student focused. Drawing of McKinnon Building at Anderson School of Management. 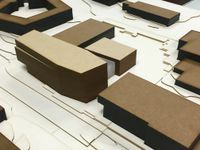 UNM architect Amy Coburn said, “This will offer a new front door on the north side of campus, along Las Lomas.” She said the new building will allow them to design a more welcoming entrance for the management school. Total cost for the new building is estimated to be $24.3 million. UNM revenue bonds will pay for $18 million, severance tax bonds from the state of New Mexico will add another $700,000 and the balance will come from a generous donation from the McKinnon family. The building will be named for the McKinnon family.